On the road yesterday we saw this van that made me laugh. I kept trying to think about how funny it would be if the guys that worked for them were dressed up in kangaroo costumes. 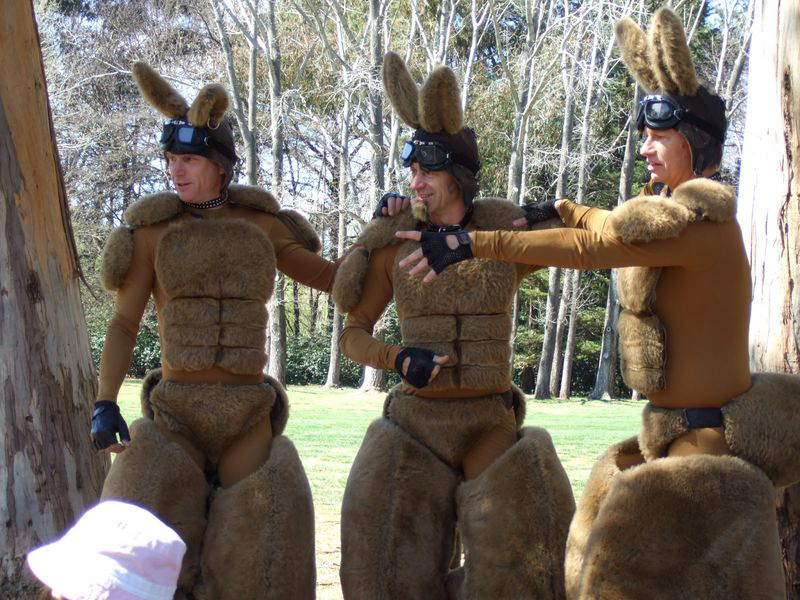 I tried to think about what these costumes would look like and did a quick image search on ‘kangaroo men’. Wouldn’t you know I found the perfect shot. I can’t tell if these are the same guy photoshopped together or triplets in kangaroo costumes which is funny on so many levels. You do lose a little something without the pouch but I guess that would just be for kangaroo women. Yeh, I know, it is amazing what I will do to waste time. Anyway, shout out to Kangaroo Men Movers for entertaining me on an otherwise quiet drive. Love the tagline: We Hop to It. And of course to Gary for slowing down so I could take the shot. Hey Jana, you did not think that the van was that funny. What do you say now?